The Picturemate inks deliver high quality photos with smooth gradation and amazing skin tones. With high print resolution of 5,760 dpi and Variable-Sized Droplet Technology, Epson PictureMate PM-520 allows you to print images that reproduce the minutest details and most subtle colour tones. The superior printing speed of PM-520 allows you to print borderless 4 x 6 photos in just 36 seconds. Reproducing superb-quality photo prints has never been this fast and easy. With PM-520’s optional rechargeable battery pack, you can instantly print pictures anytime, anywhere – a great option for outdoor use. Now, your photo lab is mobile. Save time with easy, direct printing through the built-in memory card slot, USB port with a PictBridge compatible camera or USB flash drive. The tiltable 2.7” LCD screen lets you view and make last-minute effects before printing, making photo reproduction hassle-free and possible even without a PC. For more information on Epson Connect, please visit it here. Now you can easily customise printing to fit various photo sizes for IDs, passports and visas. 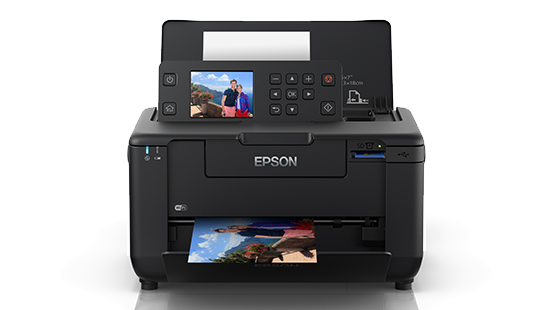 Epson PM-520 makes photo printing convenient with PC-less operation. And with just one click, you can print multiple copies in multiple sizes – the perfect solution to your photo printing needs. *1 Print speed (Pages Per Minute) is calculated when printed on 10 x 15 cm Epson Premium Glossy Photo Paper with the default print settings. Print speed may vary depending on system configuration, print mode, document complexity, software, type of paper used and connectivity. Print speed does not include processing time on host computer. *3 Otherwise 3mm top, left, right, bottom. 10mm each side for A5.